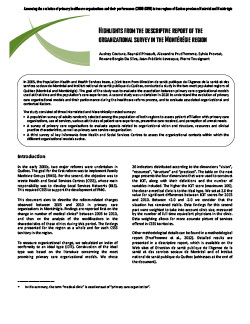 This document aims to describe the reform-related changes observed between 2005 and 2010 in primary care organizations in Montérégie. Findings are reported first on the change in number of medical clinics between 2005 to 2010, and then on the analysis of the modifications in the characteristics of these clinics during this period. The findings are presented for the region as a whole and for each CSSS territory in the region. In the region, we observed a very slight decline in the number of primary care medical clinics between 2005 and 2010 (-4); this decrease, mostly due to small (mostly solo) clinics closures, was compensated by merges and the ongoing implementation of FMG, and the beginning of NC implementation. There was also, in the region, clear improvement in the index of conformity to organizational ideal type (ICIT) between 2005 and 2010. This improvement was due mostly to existing clinics implementing FMG. Given the nature of these changes, we found that ICIT scores for the dimensions “structure” and “resources” were the ones that changed the most. The changes related to the “resources” and “structure” dimensions were very similar; moreover, “vision” sometimes appeared to move in the opposite direction of the other dimensions: when it improved, the others often deteriorated, especially the “resources” and “structure” dimensions. Finally, while global regional ICIT scores were relatively stable (+1.9), positive changes in some CSSS territories were quite significant, but were hampered overall by the negative changes in other CSSS. As a result, in 2010, there were broad disparities among CSSS territories in the region, a characteristic that is undoubtedly a highlight of the findings presented in this report.